Foreign receptacle, is this the grounding type? Is it for 230 volts? 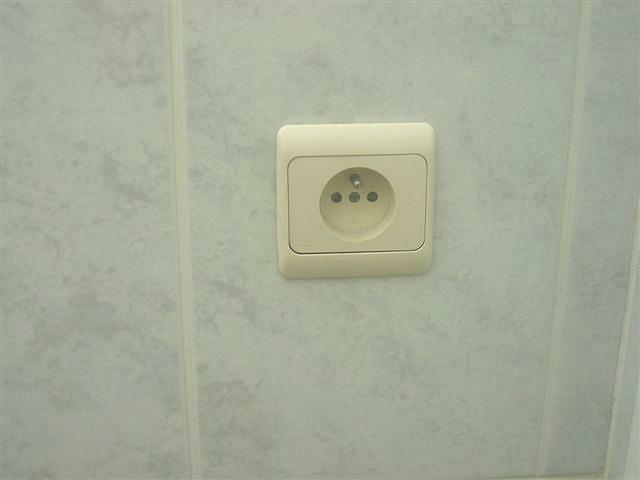 Looks like a 230V French standard earthed (grounded) socket outlet, Joe. Did you see it in the States or in Europe? How was your visit to the Netherlands, did you take some more pictures? The shucko outlet isn't common over here in the Netherlands, it's only being used in Belgium and France. The pin is ground, unlike receptables over here they are always installed with the same polarity. I took this picture while visiting Belgium. We had a great time. I didn't find too many electrical problems though in the Netherlands. Indeed it does look like a Belgian outlet. 230V 16A but also accepts 2-pin "europlug"
The metal prong in there serves as the ground/earth connection and also imposes the polarity when used with the appropriate plug. wall suspended on its wiring. The Belgian system has imported the hanging-out-of-the-wall-supported-on-its-wiring method of installation and it is actually in quite use widespread now When I bought this house there were three or four sockets like that, which I re-seated. 40cm behind the mixer tap of the kitchen sink. I didn't like that at all, so I turned off the mains to it at its circuit breaker and put packing tape over the breaker switch. The sockets quite close to the sinks in the bathrooms are protected by an RCD, but for some reason the kitchen one is not. This was all installed by a "proper" electrician and was inspected before they made the mains connection (it was all rewired by the previous owners of the house, before I bought the place). The installation in the local park has bunches of mains wires sticking out of the ground with "choc blocks" to connect them together. They are supposed to be for lights, along the borders of the paths, but the whole set of lights was never installed. That park renovation was started three years ago, so if like most Brussels building jobs, they'll finish it in 2007/2008. Is it for 230 volts? These days, almost certainly, but I believe that the same outlets types were also employed in those areas which used 127V in the past (supplied from a 220Y/127V three-phase system). "trois fils deux cent volts" - which have completly different meanings. A brisk "Allez! ", then he tottered of in the general direction of his dejeuner, a wisp of blue dung-fumes wafting in his wake.